Select the Items Checked Out tab at the top of the My Account area to display all of the items you currently have checked out. 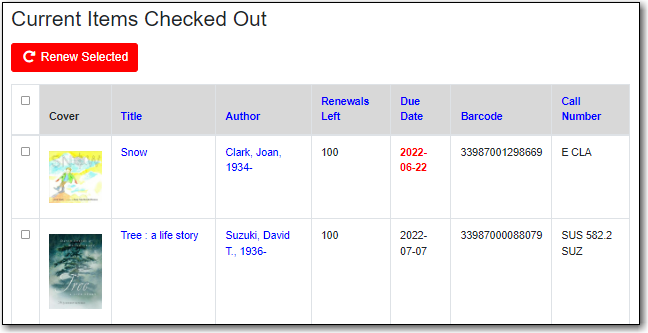 You can sort the list by Title, Author, Renewals Left, Due Date, Barcode, or Call number by clicking on the blue text. The first click sorts the list ascending, a second click sorts the list descending, and a third click returns the list to its orginal order. If you wish to renew items select the items you wish to renew and click Go beside Renew Selected Titles. Select the Check Out History tab to display a list of items that you have previously checked out. Check out history will only display if it has been enabled in your Search and History Preferences. 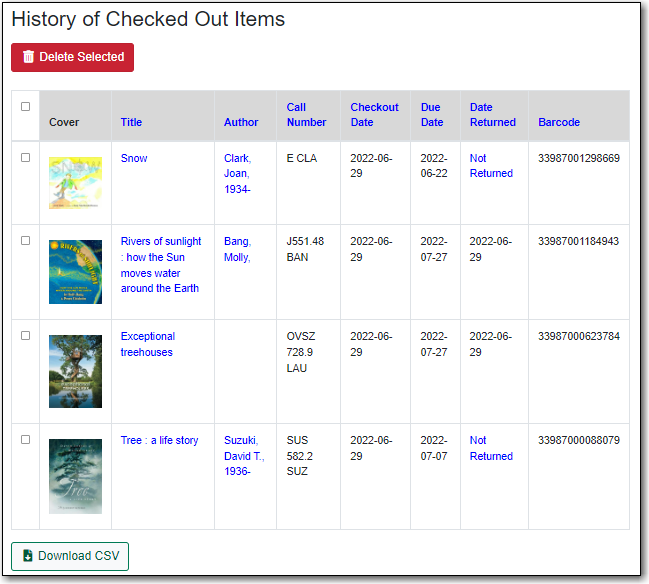 You can sort the list by Title, Author, Checkout Date, Due Date, Date Returned, Barcode, or Call number by clicking on the blue text. The first click sorts the list ascending, a second click sorts the list descending, and a third click returns the list to its orginal order. If you wish to delete individual titles from the list select the items you wish to delete and click Go beside Delete Selected Titles.